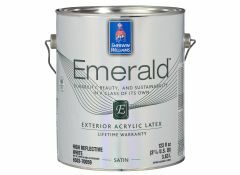 Sherwin Williams 1 gallon certificate Emerald Exterior paint from Sherwin-Williams is their finest exterior paint. It provides outstanding coverage and smooth, uniform appearance. Available in flat, satin and gloss and in all colors. Once your order is processed a certificate will be mailed to you within 2-3 business days. Present your certificate at the business to redeem your item. No cash value. Expires 7/31/19.